The Play Store might be an app treasure trove, but you can actually achieve a lot just by using the Android features your phone already has. Here are 12 of the best, often overlooked smartphone features that have been hanging in the background, just waiting for you to notice them. Since the 5.0 upgrade for Android Lollipop, all smartphones come with a flashlight in the quick settings, removing the need for an app to perform this service. To see the light, simply pull down from the top of the screen with two fingers then tap on the flashlight icon. If that doesn't work, one of the apps in the story below should do the trick. Even older Android smartphones can be equipped with OK Google, the free feature that turns them into all-knowing sages. Internet connection is required, but all you need to do is tap the microphone icon on the search bar and ask your phone whether it will rain tomorrow, what Donald Trump said today, or anything else that's puzzling you. Energy saving mode is another smart feature that was activated in Lollipop 5.0. While the idea had already been implemented by Sony, HTC and Samsung, it now seems all the manufacturers will soon convert to Google's model. It works by restricting your phone's background activities and putting it into a deep sleep every time the screen is dark and can be effective enough to mean you only require a single charge over a whole weekend. You can even set a threshold, meaning sleep mode activates as soon as your battery level drops below a certain percentage. 4. Manage interruptions to reduce noise. Lollipop 5.1 and the forthcoming Android M offer a new way to manage how your phone notifies you of calls, messages or other forms of contact. There are three modes: No interruptions, allow only important interruptions or allow any interruptions. You can decide what, or who, is important. In 5.1, the LED will flash when a new notification arrives in each case. It is also possible to only be alerted when the people you have marked with a star in your contact book call. With the release of Android M you will also be able to specify that the phone doesn't ring when someone calls twice in quick succession. Saving precious bandwidth on your Chrome browser is pretty simple. Just open settings in the top right of your screen, scroll down to 'Data Compression' and you're away. After a few days you can see statistics on how much volume you have saved – it can often add up to dozens of megabytes a month. Did you know that you can connect to secure WLANs without even having to type a password? Most routers have a button labelled ' Sign in' or 'WPS/Reset' or a picture of a double arrow, usually found on the back or the underside . Once you've found and pressed this, anyone can access the Wi-Fi for a short time. To do so, they just open the Wi-Fi menu, select 'Advanced' and then tap the WPS push button – it should connect within seconds. Android Beam is one of Android's most under-rated features. It's a great little innovation that differs slightly on every smartphone but always retains the same basic function – it allows you to easily transmit small amounts of data to paired devices via Bluetooth and larger amounts via Wi-Fi. The first step is to ensure both devices are activated in Android Beam. To do this, go to Settings > Wireless & networks > More > Android Beam . If the item is grayed out, you'll probably need to turn on NFC (see below). Once that's done, you should be good to send and receive almost anything you choose. Most of us are still tied to outrageously expensive data plans with far too little high-speed volume. To avoid that eye-watering moment when the bill arrives, you can set a limit on how much data you use. Go to Settings, then Wireless & Networks, then 'Data Consumption' and you can activate 'Set Mobile Limit'. Set the orange bar at about two thirds of your limit and you should always have enough left to allow you to switch it back on when you really need that high-speed data. It's 2015 but apparently there are still times when the Wi-Fi fails. But fear not, your Android phone has a solution, of sorts. If you simply must send a long and angry email to your service provider explaining the inconvenience they've caused you, you can connect on your PC using your phone. First you need to attach your phone to your PC with a USB cable. Then go in to the Settings menu in Wireless & Networks and select 'USB Tethering'. Windows PCs will then find the correct driver and use your phone as if it were a USB modem. Make sure you turn Wi-Fi off on your phone so the computer uses the mobile internet and not the dead line. Smart Lock is a clever little feature that lets you disable the standard touch screen unlock in certain circumstances, such as when a nosy colleague or friend always seems to peer over your shoulder as you enter your code. It may not be on every phone but it's worth looking here: Settings > Users > Security > Device > Screen lock. If it works, all manner of alternative unlocking tools, such as facial recognition, become available. Android 5.0's Guest Mode gives you a separate area to test apps, store images and perform any number of other functions, without altering your carefully constructed and balanced Google account. Guest mode can be reset completely after a single use, with any apps, pictures or downloads deleted from the internal memory. This isn't available on all new smartphones but if you have it, this is how you use it: Pull the notification area down and hit the blue avatar in the top right, then press 'Guest'. Then test drive whatever takes your fancy and save or remove the session, using the same blue avatar. Sometimes clearing your cache is enough to get rid of that irritating app that crashes more often than it works. But for those times where it hangs around like an unwanted guest at the end of a party, you can delete your app data. Simply go in to Settings, select 'Applications', then pick what you want to remove and either uninstall it or delete your cached data, depending on your preference. Once you uninstall an app, you will lose your data, so this should normally be done a last resort. This is a pretty long list but it's still far from exhaustive. We're always finding new features but what else do you know about? 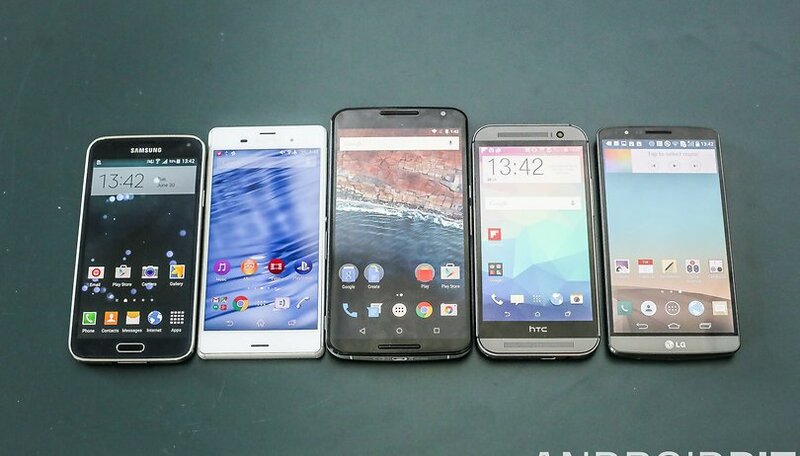 Which are your favorite Android features and which do you think are totally unnecessary? Let us know in the comments. This text is based on an article by Eric Herrmann for AndroidPIT Germany. Sleep mode? I often keep my phone open 24-hours. Neat. And in my KitKat phone, saw a way to control apps auto-starting at bootup. It's in settings > security > device admin > auto-start management. What I take away from this article is that manufacturers already had superior versions of some/most of these features, and Android 5 enables us to use inferior versions. Android 5 finally managed to push me towards Apple where features are added rather than taken away. if that's what you take away from this article you are either illiterate or an idiot. So you are going to leave android to go to apple to ios9 update which is mostly taken from android and is three years behind, I guess that must make perfect sense to you! Where to get sleep mode? I got flashlight gl on my phone. It is free. Just touch the app and the flashlight is turned on. I also can say Okay Google turn on flashlight. And it does. Also you can turn off the flashlight the same way. I have a Android lollipop version 5.1does anyone know how to enable or disable data with only one click???? I have found a smart way to solve this one problem.you need to install Nova Launcher Prime first from the Google Play after that under setting of nova launchet you need to set a gesture In nova settings under shortcut you'll find a column of data usage and ola!! quick way to turn on the data usage is with you now. My S5 doesn't have the flashlight from the Notification panel. I find smart lock particularly useful, it means that I don't need to enter my pin at home or in the car, or work. I have it set for my parents house and partners. One of the first things I did with my S5 was to limit the data usage. My old S3 contract had unlimited 3g data, my new contract has 2gb! And that includes 4G data. Suffice to say WiFi is on constantly. The S5 has different Power Saving options than the stock Lollipop 🍭. I have the S4 running lollipop and the flashlight is definitely there in the notification panel. You can edit what you have in there. Pull down the notification bar and touch the small setting button. You can then highlight what is in the notification panel. If I remember right it wasn't there with kitkat but is there now. When swiping down once for notifications panel, swipe down again for a brief settings panel. Flashlight is bottom left on my Moto X. A two fingered swipe from home screen should do the same thing, bypassing the notifications panel. S5 has flashlight on notification in the tools.